Eric Dier scored the decisive spot-kick to win the shoot-out 4-3 and send Gareth Southgate’s young team through to a meeting with Sweden, who earlier beat Switzerland. A bad-tempered match at Moscow’s Spartak Stadium that featured eight yellow cards – six for Colombian players – ended 1-1 after 30 tense minutes of extra-time, meaning the game had to be decided by penalties. The South American side, without injured forward James Rodriguez, appeared on the edge of reaching their second consecutive World Cup quarter-final when Jordan Henderson’s effort was saved by Colombian goalkeeper David Ospina, keeping the score at 3-2. But Mateus Uribe then rattled the crossbar and after Kieran Trippier levelled at 3-3, England goalkeeper Jordan Pickford saved from Carlos Bacca, extending his left arm to stop the ball as he dived to his right. That gave England match point and Eric Dier made no mistake, beating the despairing dive of Ospina before he was mobbed by his teammates. It is the first time England have won a shoot-out at a World Cup – and comes after six failures in seven attempts at major tournaments before Russia. 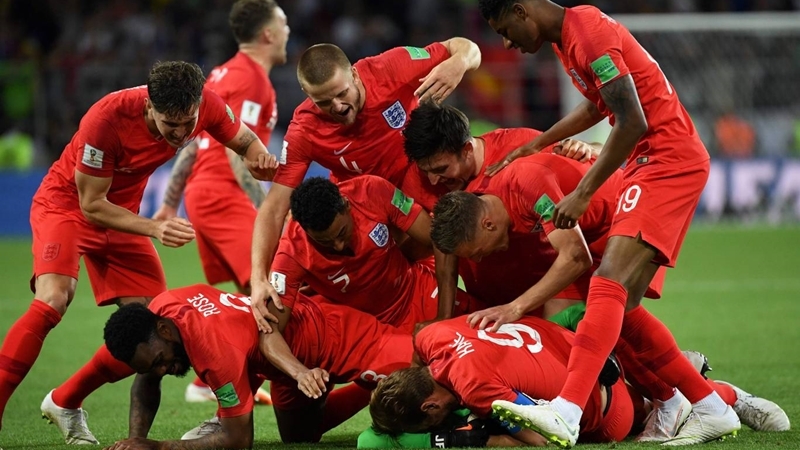 Southgate’s team were minutes away from victory during normal time but Yerry Mina rose to head home an equaliser from a corner and cancel out captain Harry Kane’s 57th-minute penalty. The late, late goal deflated England and the momentum shifted visibly towards the South Americans, who started extra-time with a spring in their step. “To get knocked down at the end like we did with that goal in added time, you know, it’s difficult to come back from that,” said Dier. England, for so long under-achievers on the international stage, are the only former winners left in the bottom half of the draw and, with Sweden up next, will fancy their chances of reaching the semi-finals for just the third time in their history. Pickford is the first England goalkeeper to save a penalty in a shoot-out at a major tournament since David Seaman at the 1998 World Cup against Argentina. “It’s a great night to win a penalty shoot-out,” he said. “Ideally we don’t want to be going to a penalty shoot-out but we are delighted for the fans and the whole country. Kane’s penalty in the first half made him the tournament’s top scorer with six goals, two clear of Belgium’s Romelu Lukaku. With Spain already ejected, England face Sweden in Samara on Saturday (July 7), with Russia and Croatia potential semi-final opponents. Brazil and France lurk in the top half of the draw but Lionel Messi’s Argentina and Cristiano Ronaldo’s Portugal are out. In yesterday’s (June 3) game, RB Leipzig striker Emil Forsberg’s deflected 66th-minute shot took Sweden through to their first World Cup quarter-final since 1994, with the Swiss unable to respond in Saint Petersburg. Suspensions deprived Switzerland of key defender Fabian Schaer and captain Stephan Lichtsteiner, but they will be disappointed by their limp exit. Sweden coach Janne Andersson said his side were not finished yet. “We’re not satisfied with this,” he said. “We want to win the next match as well. If you start to lower the bar or your ambition that's not going to be satisfying. Away from the drama in Russia, the German Football Association (DFB) confirmed that coach Joachim Loew will remain in his job despite the World Cup holders’ shock elimination in the group phase. “I am very grateful for the confidence that the DFB has again shown in me and I feel a lot of support and encouragement despite the justified criticism of our elimination,” said Loew, who has been in charge for 12 years.